The only target this game has, is the quarters in your wallet. A few weeks ago, I had the privilege of spending some time (and more than a few quarters) at the giant arcade in the Cedar Point Amusement park. 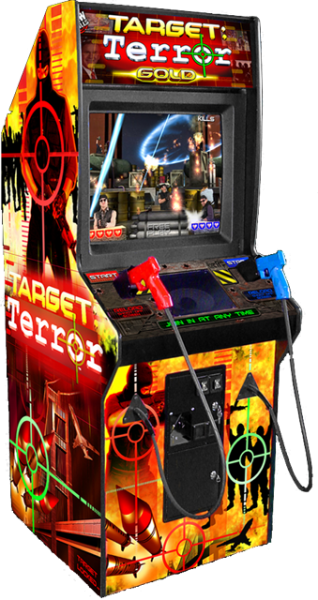 There were many games I got to try out for the first time, and one of those was the subject of today's Co-Op Classics, Target: Terror. I'll admit to you right off the bat that it's very debatable whether T:T counts as a trueclassic in anyone's eyes, but it is certainly... memorable. There's an old Saturday Night Live skit, from back in the day when the show was actually funny (hey, it's an editorial, I can say things like that). 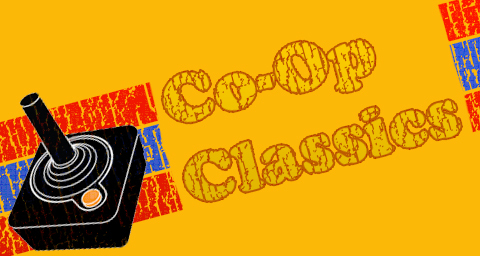 I'm not sure exactly who was in it, these many years later, but I recall Tom Hanks was the host, and it was in the Phil Hartman/Kevin Nealon era. The skit begins in a family kitchen, when someone drinks milk from the carton, and it's spoiled, gone all chunky and gross. After one person spits it out, the milk is shared by everyone, passing it around until everyone has tried a curdled, nasty sample. "You won't believe how bad this is!" says one of these unfortunates. It's a great skit, funny to this day, and it points out one fundamental quirk that people have. Sometimes, something can be so bad, it's good. Looking for other instances where this is true? How about the immense popularity of low budget sci-fi movies like Mega Python vs. Gatoroid or Mega Shark vs. Crocasaurus. These "films" have horrible effects, atrocious acting, and yet they are successful enough to keep the filmmakers in business. It's fun to watch movies like these, and other miserable Z-grade films like Plan 9 From Outer Space so we can make jokes about them, or just laugh at the outright absurdities. Mystery Science Theater 3000 took this concept and ran with it for many seasons. I submit to you today that Target: Terror is the video game equivalent of Mega Pirahna or The Rocky Horror Picture Show. It is so down-right horrible that it turns around like a boomerang and becomes enormously entertaining. It is a lightgun shooter so bland and uninspired that it elevates itself to notoriety, purely on the merits of its hum drum mediocrity. It is a compelling study in "blah", a masterpiece of "meh", and it is a game you will never forget playing. Page created in 1.9688 seconds.